Fraud investigation verifies whether a scam or a fraud has been allegedly committed and tries to establish evidence if a fraudulent conspiracy has occurred. There are many cases in which a company is indicted of committing fraud. For example if a company claim about the proficiency and quality of the product but at the back of their mind they know that the product won’t do well but still they are promoting their brand to earn profit, in such case they are guilty of fraudulent activity. To investigate such cases, skilled team of fraud investigators are hired who can provide accurate facts and evidence and disclose the reality. Fraud investigation begins by setting up a legal meeting between the fraud investigator and the party who has been deceived. During this process the victim must hand over all evidence to the fraud investigator thereby instigating the process. The fraud investigators of First Indian detective agency investigates complex issues and develops practical solution that establish user-friendly investigator-client relationship. FIDA has an accomplished team of forensic accountants, certified fraud examiners, anti-corruption specialist team, legal counselors, detectives, and skilled investigating officers. These financial fraud investigators conduct investigating process on fraudulent issues such as bribery, forgery, asset creation, corruption etc. FIDA agents will trace the culprits involved in concealment of your company’s asset and ensures you that all the evidence and documents are collected with full security and confidentiality thereby providing practical proof. 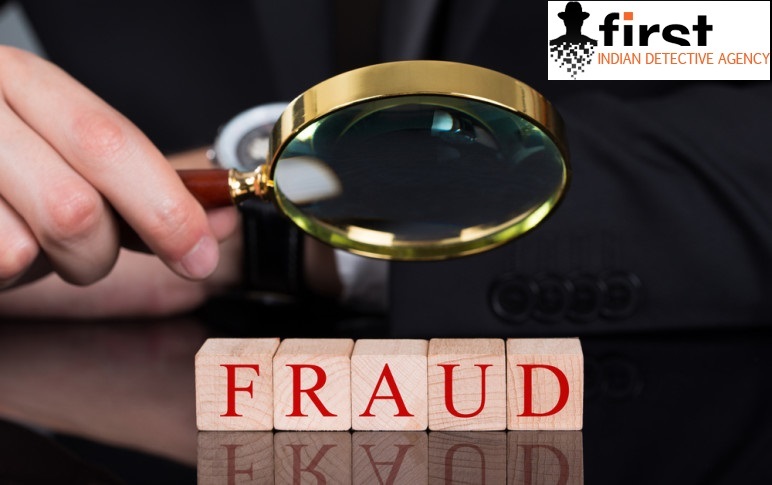 FIDA fraudinvestigators have an expertise and deep domain knowledge on fraud investigation and they conduct their investigation on frauds like false vendor invoices, unauthorized transfer of fund, fraud with cyber technology etc. The preliminary stages of investigation help in crafting investigation hypothesis on whose basis further investigation is carried out. The most important step in conducting a fraud investigation is to identify the type of fraud. It is essential to determine the type of fraud committed as it will aid in finding right evidences and contacts that will be the connecting link of the investigation. FIDA fraud investigators help you determine the category of the fraud whether it is forgery, bribery, federal corruption, company’s fake promises and policies etc. FIDA agents provide full information and contact links that will ultimately become part of your fraud investigating team. FIDA fraud investigating team provides their clients numerous documents and reports that are involved in fraud cases. These fraud investigators carefully examine the whole sequence of events and try to identify chronological links thereby uncovering all aspects of events which will eventually lead up to the actual fraud. These steps involve unfolding illicit fraud and collecting evidences and preparing documents which can only be achieved if there is a well structured plan. In some cases it is the victim who has committed fraud and thus FIDA agents investigates victims’ timeline and try to collect substantial proofs to prove their statements. Hence, a coherent plan is required to conduct successful fraud investigation. Ø Have they been victim of any fraud in the past? Ø When did they first discover that they are being deceived? The investigating process should take place in a private room, devoid of all distractions. FIDA agents ensure that discussion is confidential and they strive to make victims relaxed in order to have an open ended discussion. Looking at the complexities of fraud cases, they make sure that they get even the minute details of the fraudulent as they cannot afford to miss out any detail. The fraud investigators of First Indian detective agency ensures that the evidence is preserved and through their high-technological equipments they conduct the investigating process thereby hoarding all essential documents, emails, bank account statements, phone records, social media details etc and keeping it safely. FIDA agents make sure that the evidence is kept confidential and secured which makes them the best Indian detective agency.